Environment being an extremely gravitious and sensitive aspect, its adequate coverage becomes all the more mandatory. It is almost the backbone of our survival and consistent maintenance on earth. Electronic media needs to lend the required space and structure to the environment that it rightly holds. Its only then that a mature and palpable interaction will be made possible. Undoubtedly society and electronic media are congenially intertwined. They have very symbiotic relationship and have extraneous influence on each other. However the need is to accommodate environment effectively so that the validity of its essence is comprehended and widespread understanding is generated. 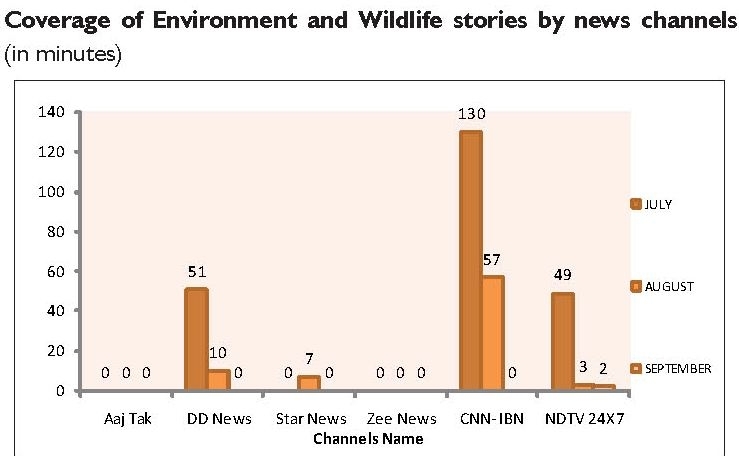 CMS ENVIS Centre has been collating and analysing the prominent news channels coverage on environment and wildlife issues in the month of July – September 2013. Over the years CMS Media Lab has acted as a source for the CMS ENVIS Centre because it has undertaken significant experimentation to develop a robust and rigorous methodology as given below. The content analysis broadly covers qualitative and quantitative aspects. Prime time band: The prime time programming is the industry benchmark in News television for all significant events and issues that are prominently covered on a particular day. Six mainstream news channels: Aaj Tak, DD News, ABP News, Zee News, CNN-IBN and NDTV 24X7. Recording: The recorded tapes were then previewed and the news stories listed under various classifications and categories to generate quantitative data. Logging: The news content on the above mentioned channels were listed and documented in the log sheets. Coding: The stories were classified and separately coded (e.g. politics, business, sports, environmental news etc.). Environment related stories: The theme specific stories were separately reviewed and analysed. Time frame: The timeline taken for this particular study was July – September 2013. In the month of July, CNN-IBN topped the chart for coverage on Environment & Wildlife by giving maximum time (130 minutes), followed by DD News (51 minutes), NDTV 24X7 (49 minutes), Zee News, ABP News and Aaj Tak channel did not cover a single story on environment & wildlife during part time in July-September 2013 time frame. 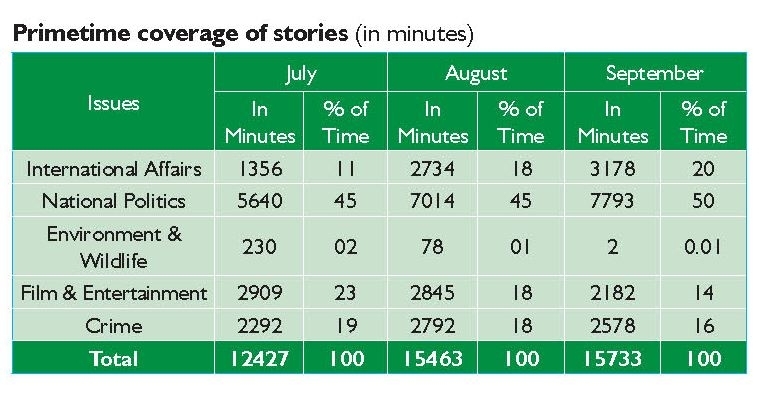 In August, the total time spent on covering environment & wildlife stories was 77 minutes which included 57 minutes of coverage by CNN-IBN, 10 minutes coverage of DD News and 7 minutes by ABP news. NDTV 24X7 covered stories of total 3 minutes while Aaj Tak and Zee news had no any coverage. The month of September reflected the tremendous changes in stories coverage by news channels that was almost nil by all major five channels. Only NDTV 24X7 spent their 02 minutes of story on environment & wildlife. The month wise analysis of primetime coverage of stories reveals that National Politics dominated the news channels in all the three months taking the 45%, 45% & 50% of the total primetime in months of July, August and September respectively. In July, Film & Entertainment Infotainment stories hold the second position with 23% of the total primetime coverage, Crime (19%) and closely followed by International Affairs (11%). In August, equal stories were on International Affairs, Crime Stories and Film & Entertainment Infotainment with 18% coverage of total telecast. However in September little bit up and down trend was observed in stories coverage on International Affairs (20%) and with 14% Film & Entertainment Infotainment secured second position, followed by Crime (16%). The environment & wildlife stories occupied the lowest coverage with just 2% of the total primetime telecast in July and nearly 1% in August and almost nil in September.